It’s quick & easy to register on Wink Bingo! From PC, Simply click on the Join Now button at the top of any page & you’ll be taken to the Registration page. Fill in your details and you’re ready to play! On Tablet & smartphone: simply click on the JOIN NOW or PLAY NOW button on Wink Bingo’s homepage, & you’ll be taken to the Registration page. Alternatively, you can download the Wink Bingo app from the App store (available for iOS only), then click the “Register” button after opening the app. Fill in your details and you’re ready to play! Definitely not! On PC, As soon as you’ve registered and/or logged in, you just need to click the PLAY NOW button anywhere on the site. This will launch the Wink Bingo lobby where you’ll be presented with our fab choice of Bingo & Instant games. On Tablet & smartphone: You can play on Wink Bingo via your browser. If you’re using an iOS device, you can choose to download Wink Bingo’s app from the App store. Can I play on your site from my country of residence? The legality of online bingo varies from one jurisdiction to another. We recommend that you consult your local authorities for specific regulations in your own area as certain countries restrict opening an account with our Company, making any deposits or using our Services. Wink Bingo reserves the right to amend the list of countries from which it will not accept users of our Service from time to time at its sole discretion. We operate under a license granted by the Government of Gibraltar. For more information on Gibraltar licensing, please visit the official Gibraltar Government site at: https://www.gibraltar.gov.gi/new/remote-gambling. Logging in from your PC: When you arrive on the homepage, simply click on the login button, and then enter your username & password to login to your account. Logging in from your tablet or smartphone: When you arrive on the homepage, simply click on "Already a member", then you just need to enter your username & password to login to your account. If you have the Wink Bingo app installed on your device (iOS only), you just need to enter your username & password to login to your account. Don’t worry, simply click here to go to our Forgotten Password page & follow the simple steps to reset your details. . If you find you're still unable to log in, simply contact our Member Support Team at any time and they'll help sort everything out for you. As soon as you login to the website, you’ll be able to see your account summary right under the top menu. If you’d like to see more details, such as your transaction history, a list of the games you’ve played, and to review or edit your details, simply click on “My Account” at the top right corner. On PC, funds can be added to your account by clicking any of the ‘Cashier’ buttons to launch the cashier. You can also open the cashier by clicking the Cashier button in the games lobby. This won’t interfere with your slots or bingo game because the cashier will pop up in a new window. On mobile, you can access the cashier by clicking the “Banking” button. Brigend provides Wink Bingo with the banking facility & are extremely flexible in the methods in which you can deposit funds. You can have up to five payment methods registered to your account. We accept all major Credit & Debit cards including Maestro, Visa & MasterCard. The other methods accepted are Neteller, Entropay, PayPal & paysafecard. 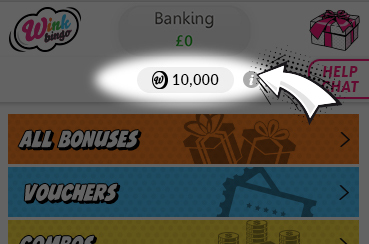 If you have a valid promotional code, enter the code into the ‘Promotion Code’ box in the cashier, click the ‘Deposit’ tab to fund your account & your funds will be transferred to your Wink Bingo account immediately. The description you will see on your bank/credit card statement when depositing at Wink bingo will be “BRIGEND”. Note: Payments cannot be made back onto a Mastercard. Please note that you must spell the promotion code correctly or you will not receive the respective bonus. How will my transactions appear on my bank or credit card statement? Basically, 75 Ball Bingo cards have 25 squares, arranged in five vertical & five horizontal rows. Each of the 25 squares on the 75 ball bingo card (except for the center square for 75-24 ball games) contains a number between 1 & 75. The aim of the game is to complete a shape or every number (coverall) on the card. Pattern Bingo is more commonly associated with 75 Ball Bingo than its 90 Ball counterpart. 90 Ball Bingo cards have 3 lines with 9 squares. The goal to try and obtain 1 line, 2 lines or a Full house before all the other players in the room. There are typically 3 winners per 90 ball bingo game. To assure the integrity of our games, a Random Number Generator (RNG) is always used to ensure consistently random results. Whether it’s the bingo ball selection, a roll of a dice, a hand of cards, or a spin of the wheel, in each event a Random Number Generator (RNG) is utilized to ensure that the outcome is truly random. The system has been rigorously tested by running millions of rounds and examining their results. The system is also systematically tested by Wink Bingo. Wink Bingo has two progressive jackpots – 75 Ball Moneyball, the 90 Ball Full House. To win the progressive jackpots, a player needs to bingo in a certain number of calls or less. For more details, please see our Bingo Jackpots page. It’s easy! When you go into any bingo room, on the left hand side there’s a ticket panel where you can choose the number of tickets you wish to purchase. The number of tickets you can purchase per game varies from room to room, but most have a maximum allowance of 96 cards. Once you select the number of tickets you’d like to purchase to the game, click on the ‘Buy Selected Tickets’ tab. Advanced Buy is a handy feature which enables you to buy bingo cards (excluding FREE cards) to future games, even in other rooms without having to leave the bingo room.. You can select which games you want to play and the maximum card price you want to buy. Even while Advanced Buy is activated you are still able to purchase more cards manually if you wish. We’ve got tickets to suit all budgets, with tickets ranging from 0p (Free Bingo) & 1p right up to £2. Our lovely Wink Bingo Chat Hosts have fun chat games playing daily in the rooms. This is your chance to earn some extra Loyalty Points for simply being a good sport & joining in with the fun! Instant Win games are an assorted category that includes scratch cards, slots and more. They can be played between bingo games, or even as you play bingo. To play Instant Games just click on the game you want to play from the list in the Instants tab. If you want to play while you’re in a bingo room you can always find instants and slot games available on the top right side of your screen. Slots work on the premise of the traditional fruit machine. Here at Wink Bingo, with over 500 slots games we’ve got something for everyone, including progressive jackpot versions of some of our most popular games. Wink Bingo also offers a range of casino style games like Roulette and Blackjack – perfect for the feel of the casino in your own home! There are numerous slots included within the Instant Games Progressive Jackpot category. For these games you can win extra big jackpots. Some of these games are: Piggy Payout, Fluffy Favourites, Aztec Rising & Double-Up Ducks. The mini, mega & maxi jackpots on these games are activated at random. In the eventuality that you are disconnected, don’t worry. As soon as there is confirmation that you have purchased tickets then these will remain active within that game & any winning funds will be credited to your account. That means that even if you lose connection your cards are still active in the game and if you win, you will get all your winnings straight to your account. For Internet Explorer users, go to ‘Tools’ and ‘Internet Options’. Underneath ‘Browsing History’ press ‘Delete’. Select ‘Temporary Internet Files’ and then ‘Delete’. For Mozilla Firefox users, go to ‘Tools’, ‘Options’ and ‘Advanced’. Select ‘Network Offline Storage’ and ‘Clear Now’. For Google Chrome users, go to the spanner icon in the right-hand corner, select ‘Tools’, ‘Clear Browsing Data’, select ‘Empty Cache’ and then ‘Clear Browsing Data’. Does Wink Bingo run on a Mac or a PC? If you're able to surf the net on your computer, you should have no problems playing bingo on Wink. We do recommend that you play through a broadband or 4g connection for the most enjoyable gaming experience. Why do I need to send you the source of the funds I spend with you? Is this a genuine request? First of all, we can confirm that this is a genuine request. From time to time we may need to request information from you that could be regarded as “personal”, but this is in order to abide by all UK gambling regulations and we guarantee that we will never share this information with any unauthorised third party. Why do I need to prove to you where my money comes from? We fully understand that this may be the first time you have been approached about sending such personal information to a gaming company, but it is a clear licencing requirement from the Gambling Commission of Great Britain. We take responsible gaming very seriously and aim to protect our players as best as we can. Therefore, as a betting operator, licensed and regulated to trade in the UK, we are obligated to know that the source of the funds you use to play with us, is legitimate. There will be times when certain financial limits and thresholds are reached, and it may be necessary for us to ask our members to provide evidence to confirm the source(s) of funds they have been playing with. This information will only ever be used as an internal reference for ensuring our customers are gambling responsibly and in line with their available finances. No unauthorised third party will ever receive this information. Wink Bingo is not alone in seeking this type of information from its customers; and it is highly likely that you will also be approached by other betting operators also requesting this information from you when your spend/play reaches certain levels. If I don’t send in proof of my source of funds, what will happen? Unfortunately, if we do not receive the required information from you, we will be required to place financial restrictions on your account. However, if, at any time you choose to send us the required information at a later date, then we will gladly lift all restrictions. All information received will be treated as highly confidential. It will only be used to confirm that the money that you spend/play with comes from a legitimate source. We have a professional and dedicated team who work to review and assess all information received in order to ensure your documentation meets the requirements that will enable you to continue to enjoy playing on our sites. We fully understand that some of our customers have complex financial circumstances which may make this request more challenging to cooperate with. However, please understand that we must always adhere to all Gambling Commissions licencing requirements. Please include your username and/or account number with any documents that are sent to us. You can upload documents through the cashier. On your PC visit the tab on the left hand side named ‘More’, click on “ID Verification” and upload your document. On mobile click on ‘Deposit’, on the bottom tab named ‘More’, click on “ID Verification” and upload your document. Wink Bingo is owned and operated by Cassava Enterprises (Gibraltar) Limited, and provides information regarding the promotional offers offered to players who have qualified as VIPs on any of the following websites www.winkbingo.com, www.888ladies.com, www.tastybingo.com, www.redbusbingo.com, www.poshbingo.com, www.bingostreet.com, www.bingoloft.com and www.bingoappy.com. How do I turn my playtime into shopping? While playing at Wink Bingo you earn Wink Rewards. These are unique points you earn by playing bingo, completing Wink’s Daily Challenges & participating in promotions. The more you play, the more Rewards you earn. Collect these Rewards and spend them in the Wink shop on bonuses, free spins, combos and more! You can even buy vouchers to your favourite online retailers. What’s the quickest way to earn Wink Rewards? Earning Wink Rewards is easy! Simply participate in our promotions, or checkout your inbox for Wink’s Daily Challenge – complete it and earn Wink Rewards. How do bingo bets help me earn Wink Rewards? I bought Bingo tickets. Why didn’t I get any Wink Rewards? In order to earn Wink Rewards, each time you buy bingo tickets, the purchase must be with real money (not bonus funds) and at least £1. Unfortunately, buying multiple sets of bingo tickets that total £1 will not count when earning your Rewards. What can I do with Wink Rewards? You can redeem your Wink Rewards by purchasing items in Wink’s Shop. All items can only be ‘bought’ with Wink Rewards and not real money. The shelves in Wink’s Shop are stacked with many different items, each with its own price tag. Items include: Bonus Combos, Free Spins, Bingo Tickets, vouchers to your favourite stores and more! If you decide to redeem your Wink Rewards in our ‘vouchers’ section, you simply need to select the retailer & voucher amount you wish to purchase. Then you’ll be asked to enter your email address and/or mobile number to have the voucher sent directly to you. How do I track my lost voucher? Where can I find out how many Wink Rewards I have? Your Wink Rewards balance appears at the top of Wink’s Shop tab in our mobile app. If you’re using a PC, your balance is displayed in the site’s header after logging in to Wink Bingo. Alternatively, you can enter the Wink’s Shop tab directly in our lobby. Who can redeem Wink Rewards? Anyone who has made at least one deposit at Wink Bingo. Just make sure you have enough Wink Rewards for your chosen purchase in Wink’s Shop. Full terms & condition of our Wink Rewards can be found here. I received notice regarding my Source of Funds, what is this? From time to time we may need to request information from you that can be regarded as “personal”, but this is in order to abide by all UK gambling regulations and we guarantee that we will never share this information with any unauthorised third party. For more information click here. Have a question? A suggestion? Wink Bingo will be more than happy to receive your feedback, which will help us to create a more enjoyable game environment for you. This is a direct dial number and is not toll free. Need some help? Whether it's about bingo, slots, your account or bankroll, Wink Bingo is here to help. Enjoy your bingo experience without worry.